A few days ago Grant Petty, CEO of Blackmagic Design announced the newest member to their family of professional cameras – Ursa. A high end cinema camera, with 10 inch fold out on-set monitor, large user upgradable Super 35 global shutter 4K image sensor and internal dual RAW and Apple ProRes recorders. The most exciting feature being the camera’s interchangeable (and therefore upgradable) sensor. 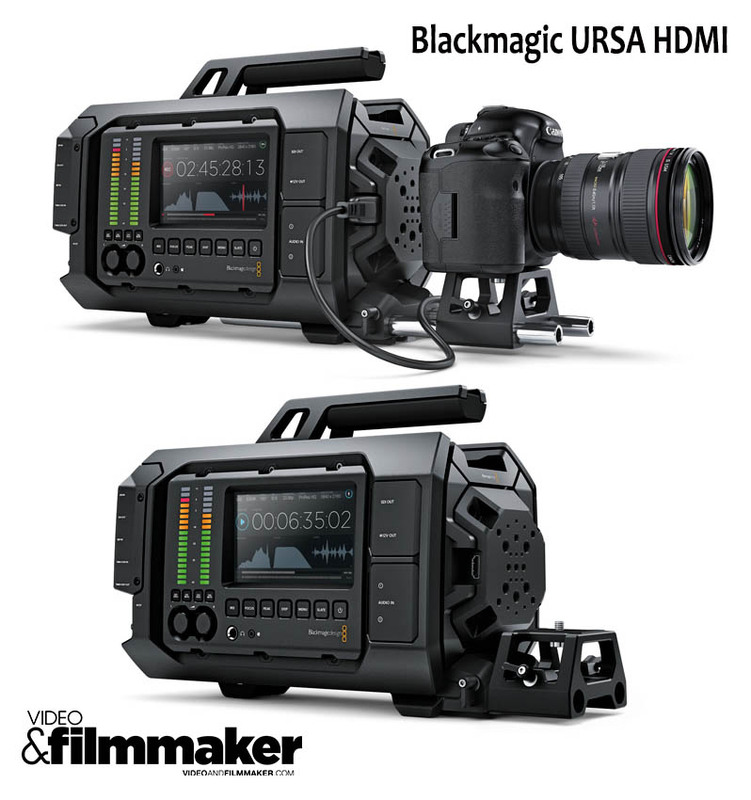 You can check out our article outlining the Ursa specs along with all of Blackmagic Design’s other new products, here. Impressions of the camera have been coming in thick and thin. The common theme being that it’s an absolute work horse of a camera and and that it’s large! This is not your hand-held or documentary style camera like BMD’s earlier procams have been, rather it’s their semi-giant younger brother. Seriously, check out some of the hero shots released by Blackmagic below. The reason for it’s girth is largely due to the space allotted for the ‘liquid’ cooling system in the camera, thus allowing it to shoot in higher framerates (and for future sensors). It also has to accommodate not only the 10″ monitor but two other screens as well. The right side has a smaller screen with touch controls, whereas on the left sits the 10″ monitor, which then unfolds to reveal a smaller 5″ screen showing timecode, histogram, waveform and a spectrum scope (for double checking focus). It’s important to note it’s quite heavy too, weighing in at 16.5 lbs/7.48 kilos (without a lens). The camera is also a dedicated audio recorder with two XLR inputs, phantom power and large VU meters, bright enough to be seen easily by a boom operator (and everyone else on set) standing away from the camera. Thought has been put into where each of these components are located, BMD describe them as ‘zones’. This is for ease of use when operating the camera and to prevent crew members tripping over each other whilst shooting. “The only obvious oversight in the physical profile of the thing is that there is no traditional eyepiece viewfinder. Some people don’t like the ten-inch fold-out TFT. I think it’s fine, but I’d want a more traditional viewfinder too for brighter conditions, and that’s an add-on at this point. This is doubly true for the B4-mount variation with a smaller sensor which is due later in the year, and which is very clearly intended for documentary and off-the-shoulder use where the pop out display will be less suitable” (source). 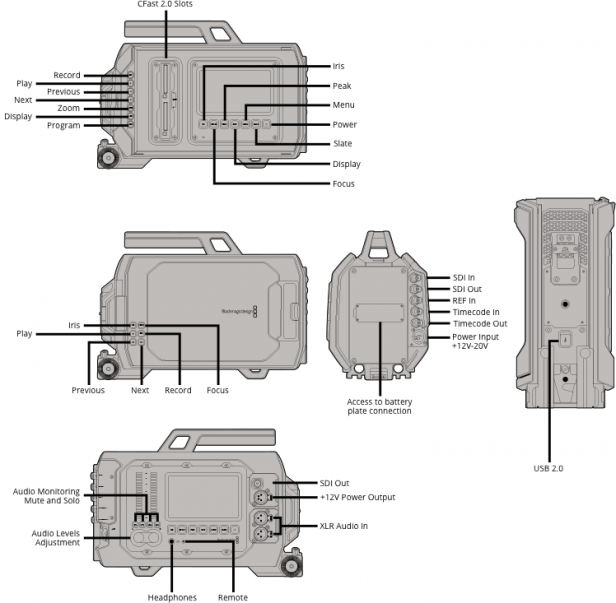 BMD describe the camera as ‘upgradable’, which means, having interchangeable parts allows the camera to take on different profiles depending what is needed for each scene/shoot, allowing you to easily slip in-&-out of them by removing four bolts from the camera turret. However, it’s still remains to be seen if this interchangeability will be a useable feature on-set and all depends on the time and ease of changing parts. In saying that, it still means that initially (at least) price can be relatively small for those working within a tight budget, allowing you to hire the additional modules as you need them. It also means the life of the camera is increased because when new tech becomes available, you can just upgrade rather than having to purchase an entire new procam. The Ursa will initially ship with either the PL or EF mounts (both include the Super 35mm/4K sensor), with two further versions, the Ursa Broadcast (Ultra HD & B4 mount) & the Ursa HDMI becoming available in Q3 this year. Interestingly, the HDMI version has no sensor at all, just a series of mounting points and a HDMI input, allowing the camera features to be ‘added’ to any camera; like a Panasonic GH4 for example. BDM have described this as being a “cheese-plate” effect which is a colourful way of saying that this version can become a central figure for many functions (monitor, sound recorder, dual video recorder, and professional interface). In addition, it’s safe to assume the cost of the Ursa HDMI could be significantly less than it’s counterparts due to the lack of sensor, although, we won’t know the actual price until closer to Q3. It’s important to note that the camera’s use of CFast 2.0 cards (there’s space for two) for recording may push the price point beyond the budgets of many. Currently the CFast cards cost somewhere around $1200/120gbs (USD), which may take some of the shine off the camera, (they will eventually go down in price). Although, in saying that, you’ll still be saving a few coins by no longer having to buy additional accessories like a bolt on monitor or audio recorder. Also, the 12gb SDI output can always be attached to an external recorder if needs be, so it’s not all bad news. The fact the camera is future-proofed with that whole ‘upgrading the sensor’ thing (as long as they continue to be made), Ursa may as yet prove to be far more cost effective choice in the long run. The camera will begin shipping in July with a cost of $5995 (USD) or $7235 (AUD, Inc GST) for the EF mount. Available from Blackmagic Design resellers worldwide. Here’s the problem. Blackmagic has been selling this same sensor on their Blackmagic Production 4k camera with RAW except it doesn’t shoot RAW. They are selling it, like this new camera, but it actually doesn’t have RAW. Blackmagic is selling cameras that fail to meet the specs they sold you and have consistently failed to meet ANY single production date. They have yet to fix any of the promised issues with the first BMCC camera, which has by far the best sensor, yet alone the BMPPC or the BMPC. Now they want to bait and switch with this new line up. As cool as this new camera looks, it’s just going to add to their reputation of simply crying wolf. Call us when you actually have a camera, complete and on time.